Nottinghamshire was a key battleground in the first British Civil War when nearly 18,000 troops faced each other during the deadly six month siege of Newark from 1645-46. They left behind thousands of lost or discarded items – the debris of war – including musket balls, coins, sword blades and even items like rings. When it opens next year the Old Magnus Building will house the UK’s first ever National Civil War Centre, dedicated to telling the story of the epic clash between King and Parliament. Work on the £5.4m project by Newark and Sherwood District Council – backed by £3.5m from the Heritage Lottery Fund – is well underway. The open day will offer a unique opportunity to go behind the scenes. Dating to 1529 the building is being restored by Edwinstowe-based Woodhead Heritage, using timeless craft skills and hi-tech engineering expertise. There will be hard hat tours to explore nooks and crannies, hands-on craft demonstrations like masonry, a chance to handle historic relics and even dress up in civil war period garb! The British Civil Wars were fought across England, Scotland, Wales and Ireland from 1638 to 1653. Newark, held by the Royalists, played a major role, undergoing three sieges. The last of these in 1645-46 caused terrible suffering. Amazing new archive material will be used together with state-of-the-art technology and hundreds of previously unseen relics to create a unique museum experience. It will also showcase the area’s wider history and link with other exciting projects to unravel the secrets of the civil war siege works around Newark and create a state-of-the-art interactive Newark Town Trail, the most ambitious planned anywhere in the UK, where figures from the past will tell their own stories in authentic settings. 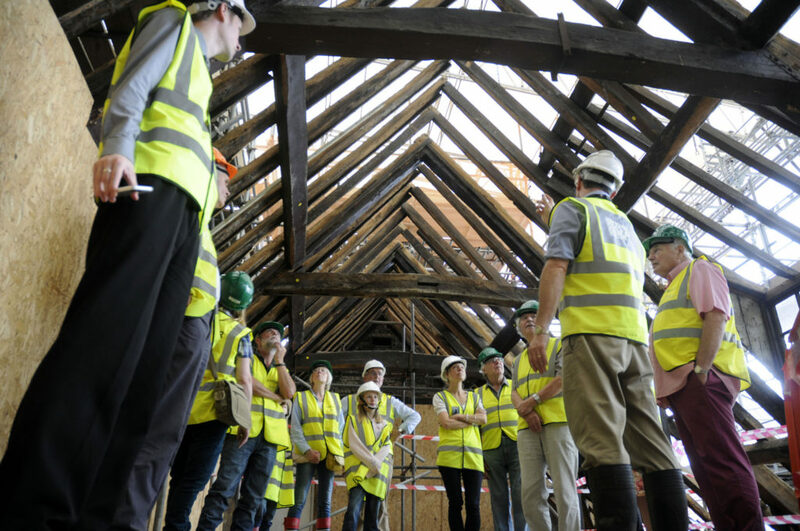 Using money raised through the National Lottery, the Heritage Lottery Fund(HLF) aims to make a lasting difference for heritage, people and communities across the UK and help build a resilient heritage economy. HLF has supported 36,000 projects with £6bn across the UK. www.hlf.org.uk@heritagelottery. Picture: Site tours were held over the day giving over 70 members of the public a unique look into the project.